When a New Moon rises in the sky, it is, energetically, THE PERFECT time to set new goals, to rid ourselves of 'the old' and prepare for the new! 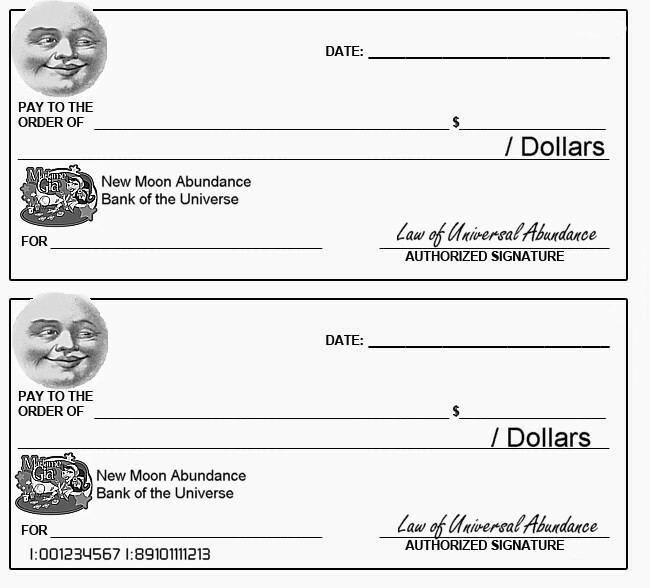 A tradition that has been passed around for decades is the writing of a "New Moon Check". This Law of Abundance tradition is a way to PHYSICALLY focus on a goal, a desire, a 'want' and then put that out there for the Universe to deliver! Most often, people write these checks to themselves, put in a dollar-amount or the word "infinite" so as not to limit themselves to the abundance that can be delivered by Universal Energy!!! This SPECIAL Page is a GIFT for you!!! Please feel free to "right mouse click" on the check images at the bottom of the page. ​ Print out as MANY copies as you'd like...use one per month ALL year long, give one to a friend...ENJOY!!! Enjoy and reprint these check images for your own use and enjoyment. Limited sharing of the printed image is permitted, but re-printing for sale in any form is strictly prohibited. Sharing online images or text without prior written consent is prohibited.